The only change I made to the recipe was adding nutmeg in the same quantity as cinnamon. In a Belgium waffle maker, the recipe made about 4 full waffles. You can easily break them apart, freeze and reheat the leftovers in the toaster. I’m so excited about having my own homemade frozen waffles that are so delicious, so healthy and so easy to reheat for a scrumptious breakfast in seconds. 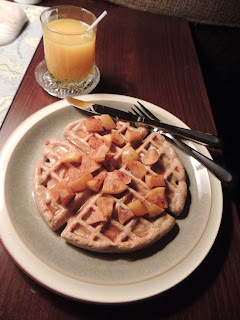 The picture shows a waffle topped with cinnamon apples which are also so easy and healthy to make. The flavor also goes really well with this waffle recipe. Here we used a golden delicious apple, but you can use whatever you like. Put the apple in a microwave-safe bowl and add cinnamon and sugar to taste. Microwave until the apple is tender and juicy. Start with 1 minute and test the apple. Microwave cooking times vary. Oh, and what’s to drink? Freshly squeezed orange juice with amaretto liquor. It’s an amazing combination and the nutty flavor pairs well with a waffle and apple breakfast. One part amaretto to 3 parts orange juice. You can make it stronger if you prefer, but this is just breakfast after all. Pace yourself!